Oklahoma City's Deep Deuce neighborhood was home to many listings in The Green Book. The name "Littlepage" still sits at the top of the former Littlepage Hotel, 219 N. Central St.
322 1/2 N.E. 2nd St. is the former home of Ruby's Grill, a popular restaurant and concert spot. A motel still stands at 3402 N.E. 23rd Street, the address listed in The Green Book for Luster's Modern Motel. A former YMCA, 614 N.E. 4th St., listed in The Green Book beginning in 1954,is now the Henrietta B. Foster Center. Wayside Motel was listed in The Green Book as 2028 N. Bryan St. The address redirects to 2028 N. Bryant St., which appears to be an abandoned motel. Simmons researched The Green Book after reading about it online, long before the movie “Green Book” was released in 2018. She found a digitally archived copy featuring dozens of Oklahoma listings. The Green Book listed hotels, restaurants, mechanics, and barbershops, as well as rooming houses, or “tourist homes,” overnight facilities typically owned and operated by women that often offered meals in addition to beds. The guide initially focused on the New York area and expanded in 1937. The book was published annually, except during World War II, through the late 1960s. According to an article by Frank Norris in the New Mexico Historical Review, some two million copies of The Green Book were distributed to the traveling public in 1962. The guide’s final edition was renamed the Travelers Green Book: 1966-67 International Edition: For Vacation Without Aggravation. Bruce Fisher, a retired administrative programs officer for the Oklahoma Historical Society, grew up in Oklahoma. He took regular vacations with his family in the early 1960s. Fisher said he does not remember using The Green Book, but he said his family had to be careful about where they went. Fisher said his father decided to patronize a different business. During segregation, many African American motorists would drive all night or pack picnic baskets of food to avoid stopping in unfamiliar cities. “Carry your Green Book with you...you may need it!” read the cover of the guide’s 25th Anniversary 1961 edition. Oklahoma first appeared in The Green Book in 1939. The guide had more than 100 listings across Boley, Chickasha, Enid, Guthrie, Muskogee, Oklahoma City, Okmulgee, Sapulpa, Seminole, Shawnee, Tulsa and Wewoka through 1967, according to digitized copies from the New York Public Library. Oklahoma City had about 40 entries, including many on the 300 block of Northeast Second Street, also known as “Deep Deuce,” “Deep Two” and “Deep Second.” The neighborhood was the center of life for the city’s African Americans from the early 1900s to the late 1950s. “Anything you needed--lawyers offices, dentists offices--you could get it here on Second Street,” said Bruce Fisher, who remembers getting his hair cut at Deep Deuce’s Golden Oak Barbershop, which was included in The Green Book from 1947 to 1955. By day, it was a business district with barbershops, beauty parlors, clothing stores, a hardware store and other shops and offices. The Black Dispatch, a weekly African American newspaper, had its headquarters in Deep Deuce. In the evening, musicians like Charlie Christian and Jimmy Rushing performed at nightclubs, dance halls and theaters, including the Aldridge Theater, Slaughter’s Hall and Ruby’s. 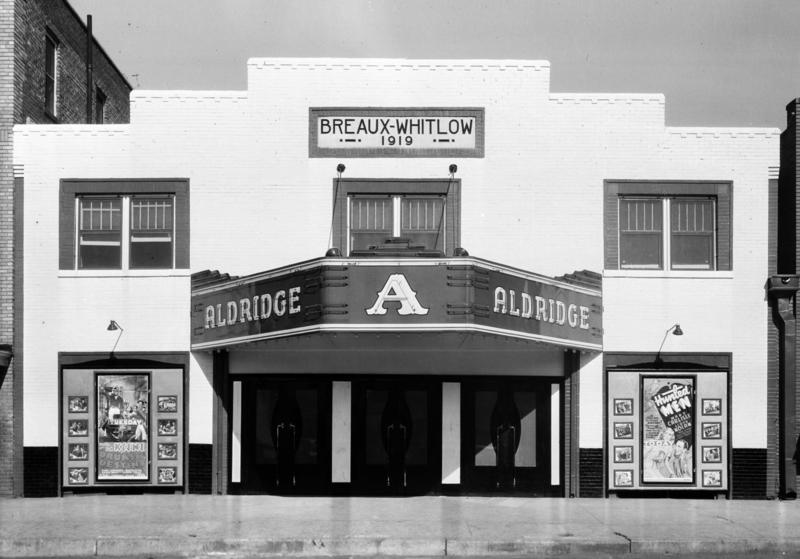 The Aldridge Theater in the Breaux-Whitlow Building in Oklahoma City. Photo taken by Meyers Photo Shop, May 9, 1946. The Littlepage Hotel, a longtime feature in The Green Book, was the home of The Blue Devils band. “Girl, we liked to have danced the planks off the floor!” said the late State Rep. Freddie Williams, referencing Slaughter’s Hall. Williams was quoted in the book Oklahoma City Music: Deep Deuce and Beyond by Anita Arnold, who also directs the Black Liberated Arts Center. Arnold lived in the countryside until she was 13. She remembers being impressed by Deep Deuce when her family moved to Oklahoma City. “I had hit the big lights. I had never seen anything like it,” Arnold said. Arnold worked at Randolph Drug Store, a Green Book business, as a high school senior. She made malts, milkshakes and sundaes at the soda fountain, sometimes unknowingly meeting well-known figures like Jack Washington, a jazz saxophonist who played in the Count Basie Orchestra. 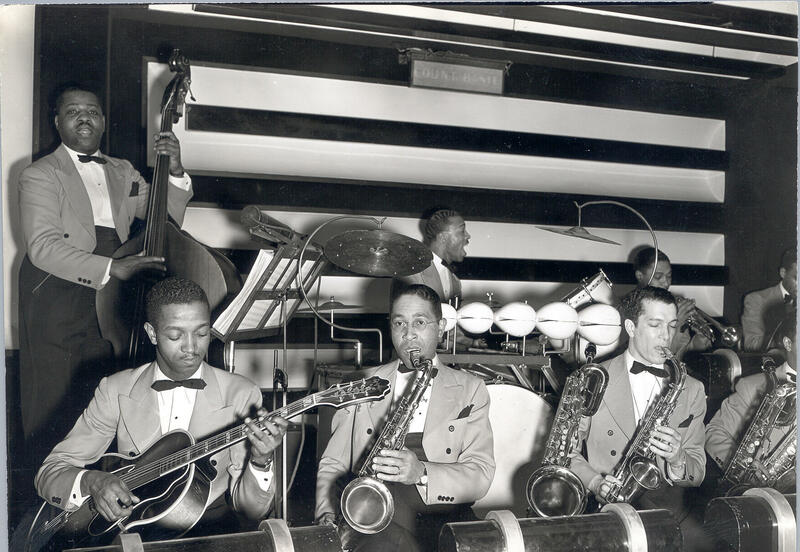 Walter Page, far left, in a photo with the Count Basie Orchestra. In July 1964, Pres. Lyndon B. Johnson signed the Civil Rights Act into law. It prohibited discrimination on the basis of race, color, religion or national origin in hotels, motels, restaurants, theaters and other public accommodations, among other things. Many previously segregated businesses opened their doors to African Americans and other races. “Black motorists, in turn, began quickly patronizing mainstream hostelries, and as a consequence, many of the businesses that had long depended on black travelers began to shut down,” wrote Frank Norris. In Oklahoma City and Tulsa, very few addresses listed in The Green Book are still standing. Many of Tulsa’s listings were centered around the city’s Greenwood District, which was looted and burned by white rioters in June 1921. According to the Tulsa Historical Society, 35 city blocks were destroyed and as many as 300 people may have died. The National Park Service is conducting a survey of guidebook properties along Route 66. So far it has found more than 200 structures out of some 360 have been demolished. But at least 86 original buildings are still standing, including a handful in Oklahoma City: the former Ruby’s Grill, 322 N.E. Second St.; Littlepage Hotel, 219 N. Central St.; Luster’s Modern Motel (now Delux Inn), 3402 N.E. 23rd St.; and Wayside Motel (now abandoned), 2028 N. Bryant St. The former YMCA, 614 N.E. 4th St., is now the Henrietta B. Foster Center. Look through a spreadsheet of the state’s Green Book listings. View a map with many of Oklahoma City’s Green Book listings. View digitized copies of The Green Book. How Curious is a production of KGOU Radio. It’s produced by Claire Donnelly and this episode was edited by Caroline Halter. David Graey composed the theme music. Additional Music Credits: Seven Come Eleven, Charlie Christian with The Benny Goodman Sextet And Orchestra; Boogie Woogie (I May Be Wrong), Jimmy Rushing; Jive At Five, Count Basie Orchestra; Squabblin’, Walter Page’s Blue Devils.